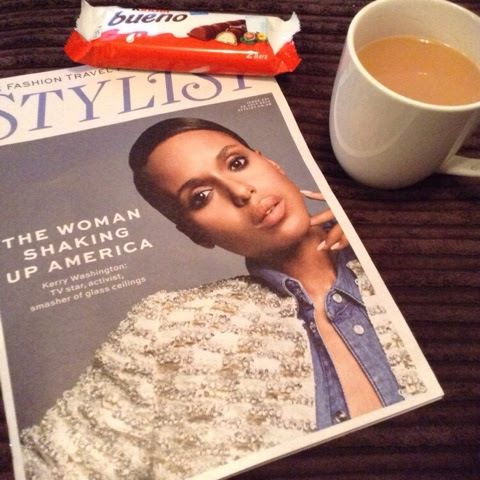 Unless you are a commuter, you may not have come across the brilliant, free weekly magazine that is called Stylist. I first started reading it last year when a friend who used to get the tube everyday, picked one up for me as they thought I would like it. They were right...I loved it! Created and launched in 2009, Stylist is described as being a magazine for smart, successful and sophisticated women. It is distributed every Wednesday in London, Brighton, Edinburgh, Glasgow, Manchester, Newcastle, Leeds, Liverpool and Birmingham (also French Connection stores, Airport Lounges, City centre offices and gyms). Granted, yes the pages are not glossy and luxurious (it is free after all!) but it gives you everything - fashion, travel, beauty, politics, people and more - all the things that you would get (and possibly wouldn't get) with a paid for magazine. I used to look forward to every Wednesday when my friend would bring me the latest copy. They always have great looking, enticing front covers and even better content with brilliant, intelligent interviews, great features and thoughtful journalism. Stylist magazine is a champion of women. You will always find some type of feature or article that celebrates, informs and motivates you. Also, on their web edition (www.stylist.co.uk) every friday at 1pm they host a 'Lunchtime Masterclass' where you can have a live Q&A webchat with an inspiring, successful woman - how brilliant is that?! When my friend stopped getting the tube into work, I suddenly lost my weekly dose of this magazine...suffice to say, I really missed it. I do not buy the plethora of weekly 'celebrity' magazines that are out there anymore. I became disillusioned some time ago now, by the same (often fabricated) stories that were being churned out by them and the terrible fixation with diets and women's body image. Stylist was different in that it still gave me my fashion and beauty fix, but in addition, well written features, interviews and items that were actually really interesting, always made me read the mag from cover to cover and come away feeling upbeat and informed instead of beaten up and 'dumbed down'! 'The style list' shows you 30 treats to get through to payday! 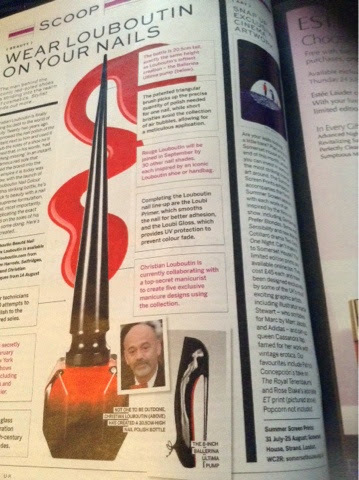 Review on Christian Louboutin's brand new nail colour line....look out for my own review on this very soon!!! After some investigation, I realised that I could take a subscription out for the magazine which means now that I have to pay for it (as there is no collection point near me in Essex). At only £1 per edition, I found this very reasonable and now I get the magazine delivered straight to my door - yay! The great thing about the subscription method is that if this magazine is not delivered in your area and you wish to try it you can choose to order just the one single copy or a subscription of your desired length. This week, Kerry Washington was on the cover (see title picture and below) and there is a really good interview inside where she talks about her Scandal character (obviously....who doesn't love Olivia Pope?!) but also her work with movements and campaigns that are trying to end violence to women and girls. I didn't realise how much of a philanthropist Kerry is and her activist work really is to be admired. Stylist magazine has won numerous awards since its launch and last year started distributing a weekly edition in France including style capital, Paris! - Such great news for a free women's weekly magazine and testament to the editor, Lisa Smosarski and the rest of the stylist team that have managed to beat the tough 'throwaway' commuter market and have actually stood the test of time. I hope it continues its values and doesn't 'sell-out' like I feel 'Grazia' magazine has to some extent, to the cheap, tabloid style fodder way of writing, as I really enjoy reading it. Roll on next wednesday for the next edition! 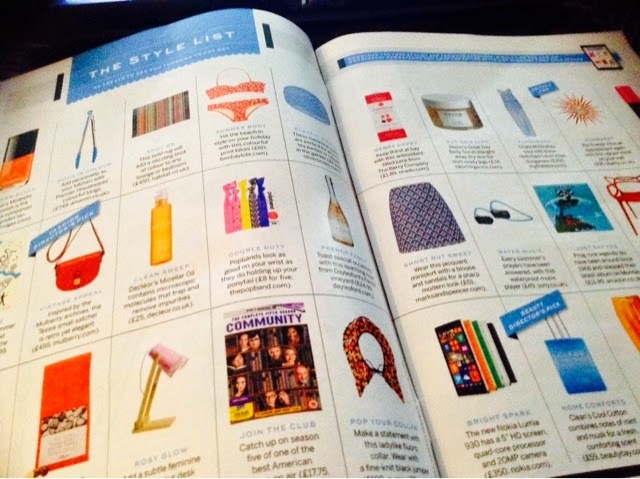 Do you collect or subscribe to Stylist magazine? Get in touch and let me know what you think.